In order to implement and validate a detector geometry in DD4hep, it is important to be able to visualise it. This wiki explores the existing options. Lots of thanks to Nikiforos Nikiforou for explaining how everything works. There are various formats used to describe a detector geometry. The info in the compact.xml is not enough to describe the detector - drivers are needed to expand info from the XML and create all the volumes. Mokka or SLIC for example create ways of inputting objects in Geant4 without programming volumes in Geant4. LCDD (GeomConverter) - LCDD is GDML augmented by sensitive detector info including cell id specs. One can then delete by hand all sensitive detector info to be left with a pure GDML file. to dump the geometry. This allows to see how SLIC loads the geometry, basically debugging SLIC as well. 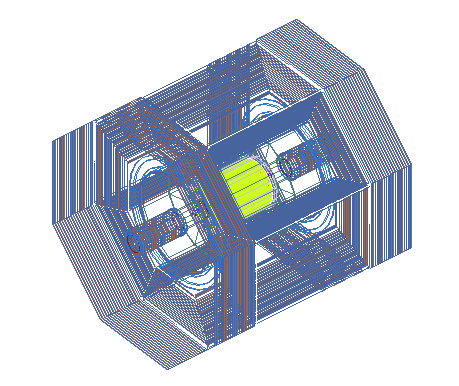 Beware of some bugs in SLIC related to assemblies and the order of rotations. or use Export(“clic-crr.root”) to export in ROOT format. By default this will dump the World volume (whole detector) in World.gdml. If one provides a subdetector as argument, it will dump just the subdetector. See the help function for more info. Beware of bug related to VACUUM material (delete the VACUUM and dummy entries by hand). One can also create a Gear file etc. where ogl selects the OpenGL engine. All figures from this section were produced like that. From Mokka, one can visualise the DB geometry via Geant4 as above. See this example.